Mah Sing Group Bhd, the Malaysian developer that spent the most on land acquisitions in 2010, said it may pay more than RM1 billion (US$330 million) for new sites this year as the fastest growth in a decade spurs sales. The developer is seeking to buy land with potential sales valued at RM7 billion to RM12 billion, managing director Leong Hoy Kum said in an interview in Kuala Lumpur yesterday. The properties, which will also include commercial buildings, will be developed in the next five to seven years. Mah Sing is boosting acquisitions as home prices climbed 6.2 per cent to a record in the third quarter, according to government data. Mah Sing spent RM756 million buying 285 acres of land last year, more than double its 2009 investments and beating Malaysian rivals as it bet on increasing property demand with government efforts to boost economic growth. Loans disbursed for home purchases in Malaysia rose to RM5.66 billion in December, the highest recorded in nine months, central bank data showed. Shares of the Kuala Lumpur-based company have jumped 44 per cent this year, the best performer on the FTSE Bursa Malaysia Top 100 Index, which rose 0.9 per cent. SP Setia Bhd., Malaysia’s biggest developer by sales, climbed 6.2 per cent this year. Prime Minister Najib Razak’s government unveiled an economic transformation program in September aimed at attracting investment, including US$444 billion of programs this decade ranging from mass rail to nuclear power, led by private and government-linked companies. Malaysia’s economy expanded 4.8 per cent last quarter, spurring full-year growth to the quickest pace in a decade and putting pressure on the central bank to take more steps to curb inflation. The central bank also placed a limit on the loan-to- value ratio for third mortgages in November, which Mah Sing said hasn’t derailed its investment plans. Mah Sing is targeting property sales to climb to between RM2 billion and RM2.5 billion this year, he said. The company sold RM1.5 billion worth of properties last year. iProperty.com Malaysia, the number one property website in the country, hit an all-time high in traffic with more than 750,000 property hunters visiting its property website last month. When compared with January last year, the website saw a 100 per cent jump in unique visitors, a 57 per cent increase in pageviews and an 84 per cent increase in visits. In a statement today, the company attributed the growth to iProperty.com Malaysia's recent acquisition of ThinkProperty.com.my, the launch of the brand's local vertical property websites, PropertyGuru.com.my and Home-Guru.com. This also include the release of innovative products such as the iPhone and iPad real estate search applications and its network of distribution partners. iProperty.com Malaysia continued to be the favourite channel for real estate agents to advertise their properties. Between January 2010 and January 2011, over 2,200 new real estate agents signed with the iProperty.com bringing the total to over 5,300 paying agent subscribers, a 74 per cent growth, since last year. "Our performance in January 2011 not only marks the beginning of a great year, it is also a testament of our commitment to our customers and consumers. "We have great plans for this year as we work to continously deliver innovative products, great service and unrivalled property hunting experience. I am confident we will continue to break even more records this year," said Country Manager Timothy Hor. Mohd Roslan Mohd Rashidi (left) and Datuk Nur Jazlan Mohamed being briefed by Frankie Tan Kiat How (right) on the project after the agreement signing in Johor Baru. JOHOR BARU: Telekom Malaysia Bhd (TM) plans to increase the number of premises which have access to its UniFi high-speed broadband (HSBB) service in Iskandar Malaysia this year. Johor TM general manager Mohd Roslan Mohd Rashidi said it was looking to achieve 45,000 commercial and residential premises connected with the services by year-end from 4,500 premises now. He said the areas of coverage would be extended from three presently to five more zones to offer wider coverage for the HSBB connectivity within Iskandar Malaysia for its customers. The five new zones are the Johor Baru Central, Pelangi, Pasir Gudang, Skudai and Tampoi areas while the existing areas are Nusajaya, Permas Jaya and Senai. “Last year was the pre-introduction of the services for our potential customers in Iskandar and this year we are going on the ground to push the services to them,'' Mohd Roslan told StarBiz yesterday. 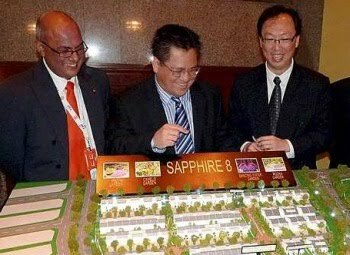 He was speaking after signing a HSBB service agreement with United Malaysia Land Bhd's (UM Land) wholly-owned subsidiary Seri Alam Properties Sdn Bhd acting head Frankie Tan Kiat How for its project in Pasir Gudang. The event was witnessed by Pulai MP Datuk Nur Jazlan Mohamed and UM Land group chief executive officer Pee Tong Lim. Last year, TM signed similar agreements with Mudra Tropika Sdn Bhd for its housing scheme in Jalan Kolam Ayer, Johor Baru and Dynasty View Sdn Bhd for its Seri Austin project in Tebrau corridor. “We are going to sign with 15 more developers in Iskandar Malaysia for similar services this year,'' added Mohd Roslan. He said the company preferred to sign with developers to provide and install the HSBB connectivity for their new residential and commercial launches rather than having the system installed at the completed properties. However, Mohd Roslan said it would not totally ignore the brown field area. The company would be selective in offering the service to such areas as it involved high cost of laying down fibre-optic cables compared to green field areas. He said one area which required careful planning was the RM1.8bil Johor Baru city centre transformation project, where the masterplan to be unveiled in the second-quarter of the year would involve the redevelopment of Johor Baru into a vibrant city.